Musician Billy Joel poses with his newbown daughter on October 23, 2017 in New York CIty. 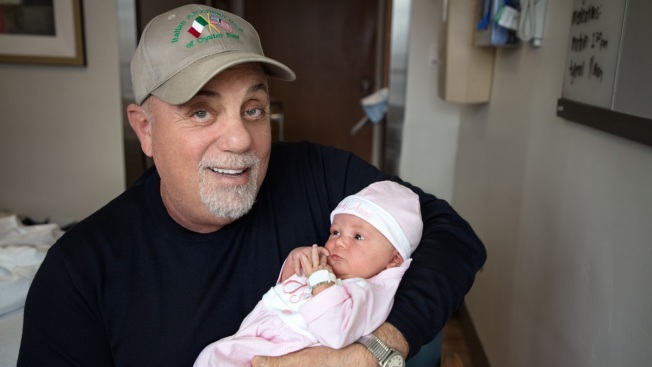 Billy Joel and wife Alexis welcomed their second daughter named Remy Anne on Sunday, October 22, 2017. Remy Anne entered the world at 7:50pm weighing 7Lbs and 3 oz. Singer-songwriter Billy Joel and his wife, Alexis Roderick, announced the birth of their second daughter, Remy Anne, on Monday. Remy Anne was born at 7:50 p.m. on Sunday at New York University Hospital in New York City. A photo of the smiling musician and his third daughter was posted along with the birth announcement on Joel's official website. "Alexis and Remy are doing well and everything is thrilled," the announcement said. Joel, 68, and Roderick, 35, who began dating in 2009 and married in 2015, are parents of another daughter, 2-year-old Della Rose. Alexa Ray Joel, Joel’s 31-year-old daughter from his previous marriage with Christie Brinkley, joined her father and Alexis at the birth of Remy Anne.